Today was the last day of the school year, and like many people, we enjoyed making a little home made gift to thank our teachers for all their hard work. This year the children have had lots of fun making Herbal Bath Soaks. We used little muslin drawstring bags, which the kids decorated with stamps using our washable, home made fabric paint – we love how they turned out, and even stamped little cards to match. We have been learning lots about herbs and their uses over the last few months. There are so many plants that have a positive action on your skin, making them perfect to use in bath products. Our 21 Botanicals that are fabulous for your skin post doesn’t cover every single one, but will certainly give you a good starting point if you’d like to learn a little more. 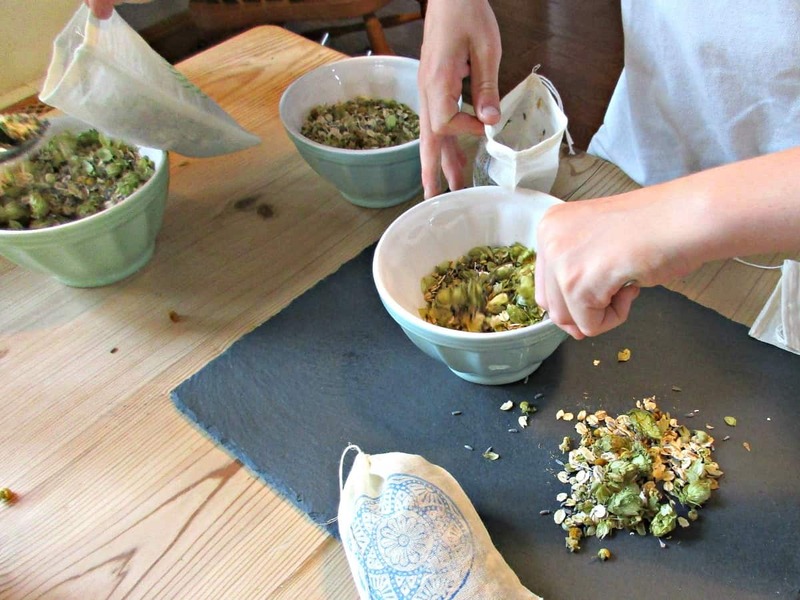 We have 2 sizes of these little bags, so decided to make two different herbal mixtures to fill them. For the bigger bags we made a relaxation soak, and for the tiny ones we put together a beautiful skin renewal mix. 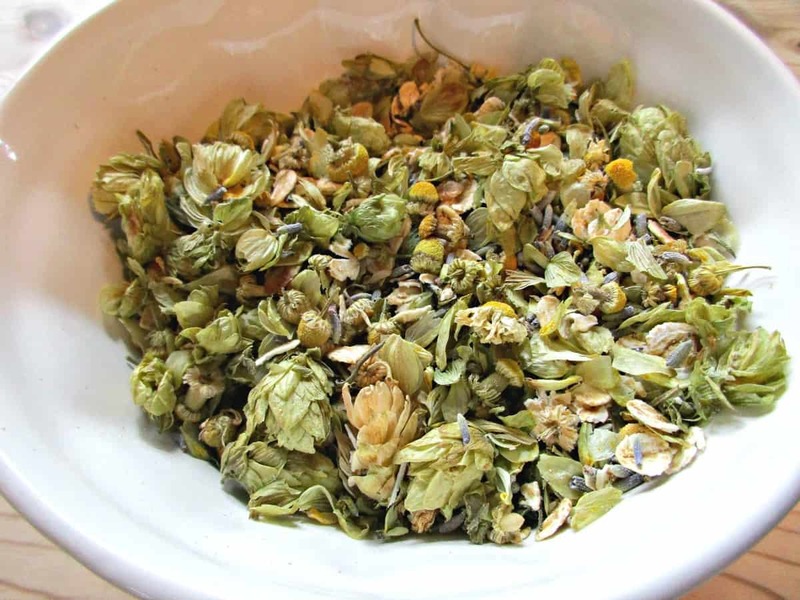 Our Relax mix combines Oats, Hops, Lavender and Chamomile to sooth and moisturise the skin, and would be perfect to have as a relaxing soak at the end of a hard day, or just before bed to promote a fabulous night’s sleep. 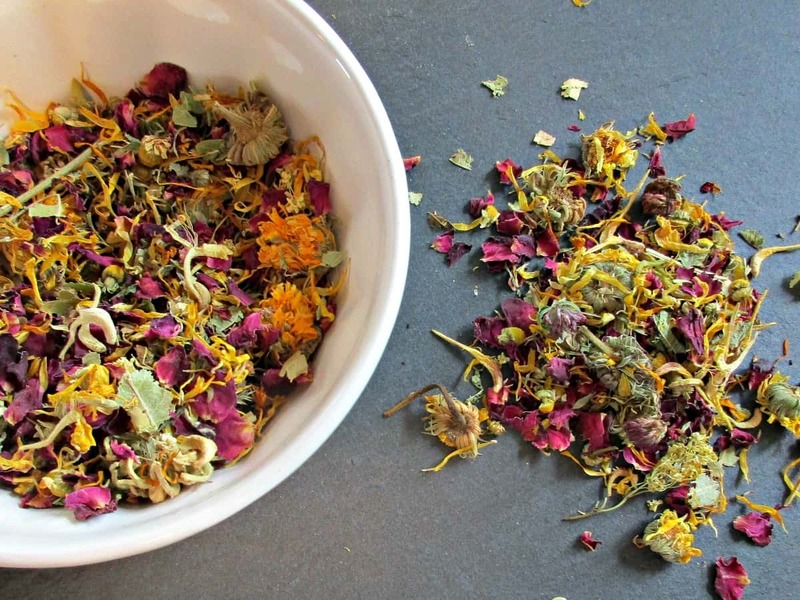 While our Renew mix contains Linden Flowers, Meadowsweet, Hibiscus, Lemon Verbena, Chamomile, Rose, Honeysuckle, Red Clover and Calendula for their beautifying, and anti-aging properties, as well as their wonderful fragrance. 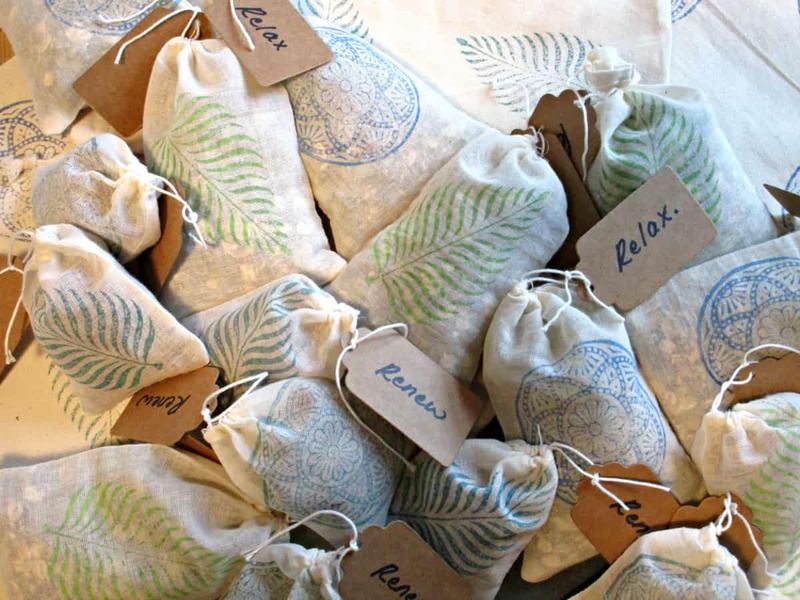 We then popped all our herbal bath soaks into a larger cotton bag, with our home-made cards and a little note telling our recipients about what is in their gift – It is important to always provide a list of ingredients for all home-made gifts in case of any sensitivities. All the children’s teachers looked delighted with their home-made herbal bath soaks, and we think it’s a lovely way to show our appreciation for everything they do. For more home-made gift inspiration why not check out our Best Homemade Reed Diffuser Oil Recipes, our Rosemary and Peppermint Foot Scrub, or our wonderful Bath Fizzes. So I know I am really late to the party here but these look awesome! My only question is what proportions of herbs did you you for the different mixes? I am looking at buying herbs in bulk for this and I am not sure how much of what would even be needed. If I missed a link or that info somewhere, I do apologize. I love this idea though and plan to do it very soon! Hi. What a gorgeous gift! What size ate your bags and what are they called? I just made homemade bath tea bags and give some to my neighbour as a present because they are new in the area and they loved it. I am planning to make more and give some to my officemates. This was a clever idea. Thanks! I collect some of them from the wild and buy the rest online Evelyn, there’s lots of good suppliers out there and loads of sellers on platforms like eBay. The bags you put them in are so pretty and the dried herbs and flowers are also very pretty. Maybe we can make art out of them… I love your blog!! Sounds like a wonderful way to the days end with a soak in the tub with a therapeutic tea soak. 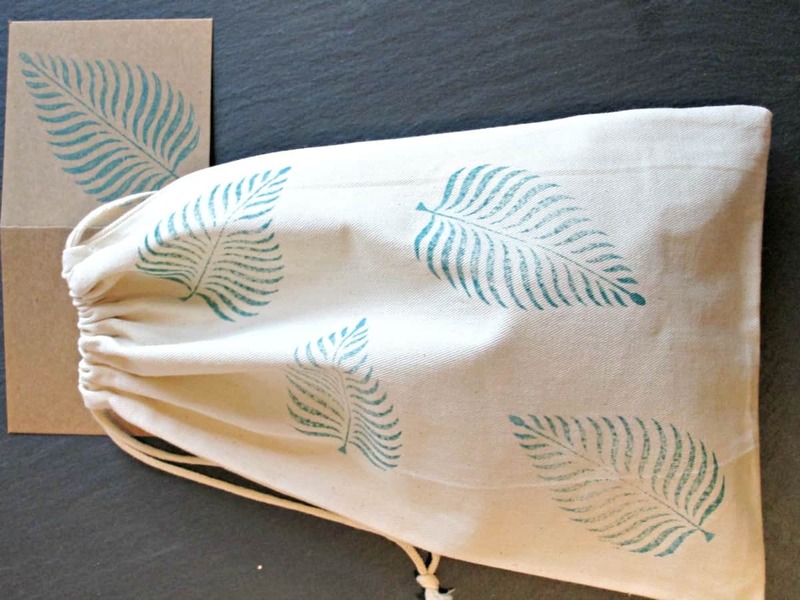 I love the gift bags with the leaf print, they are so cute! I adore the leaf block. It’s funny to think that somewhere in the world there’s a person who carved it who has no idea how much we all admire it – wouldn’t it be lovely to be able to tell them! Awesome gift for all occasions. I love how you combine your love for nature and make all these amazing things Sarah. I love giving homemade gifts and this idea is just lovely! What a nice way to say thanks to a friend or host. I’m really inspired to give these bath tea bags a try! Such a fab idea! These look like so much fun. I think I’m going to make some for my kids and myself as Christmas gifts. How did you dry yours? In the microwave or by hanging them? And do you let the flower die first and then collect or while they are still alive? I am so curious! LOL There are some cute little burlap bags at Walmart, I wonder if I could use those? Or if they are treated with something that you wouldn’t want in your bath? I may have some leftover material from pillows that I could use. You place these bags in the bath directly, correct? Can you use them more than once? Obviously I am full of questions today! These sound absolutely divine! What a lovely gift idea as you said! These are so beautiful, what a lovely lovely idea and homemade gift! I’d never use it because it’s so pretty but for sure have it up for decor! Hi Sarah, I remember buying little herbal bath soaks for my Mum back in the day and I’m sure homemade would have gone down better. Love the way your herbs have retained their colour. So pretty. What a great little gift or party favor.